Donna from Re-surface kindly dropped off some of her A-lights this weekend. 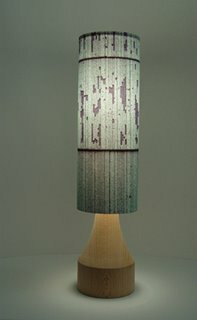 She takes very textural and architectural photos in Brooklyn and applies them to lampshades and candle covers. We've got the A-light, a petite decorative lamp with a beechwood base, in 4 shade styles. Re-surface lighting will be in the State St townhouse as part of the Brooklyn Designs show next weekend, if you want to check it out in a home setting! Candle alert: the Beccalights candle is going up in price a bit to cover rising costs by the designer, so when I run out, the new batch will reflect the price. Please shop accordingly!